Claire and Jamie (and Frank) are back for more, and our TV Fanatics are ready to talk about the entire season, starting with Outlander Season 2 Episode 1, "Through a Glass, Darkly." 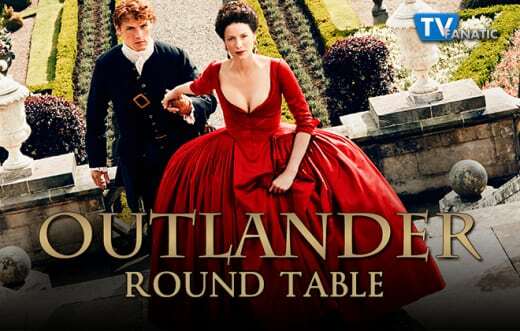 We've put together a round table team for Outlander Season 2, so please join Stacy Glanzman, Amanda Steinmetz, Lisa Babick and Elizabeth Harlow and share your thoughts on all of the thrilling action and romance from the 1740s and 1940s! 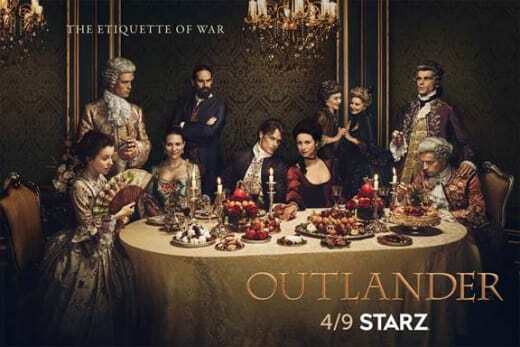 Did the Outlander Season 2 Premiere live up to your satisfaction? Stacy: I haven't read the books, so I didn't have any specific expectations, but I liked the premiere. I was a little antsy to get back to the past and Jamie, but I found the first half interesting, too. Amanda: I generally enjoyed the premiere. I had read the first book, but haven't read anything after, so I was surprised by how the episode was structured. I thought Claire returning to her own time set up a great mystery for the rest of the season. Lisa: I haven't read the books, but the premiere was great. I just wanted to have the same warm feels I had watching Outlander Season 1 and I did. Elizabeth: Wait, I'm the only one that's read the books?! Okay then, as the only person available to represent the "the book was better" position, I have to say that the premiere was....pretty darn good. I was a little disappointed to have to delay meeting certain characters, but almost all the changes worked. One thing I absolutely LOVED was the rework of the credits, switching to French halfway through the song and all. How do you think the world would have looked if Claire had come back and their efforts to stop the Jacobite rebellion had been successful? Stacy: Um, more people in kilts playing bagpipes? I honestly have no idea. Changing one event that far back in history could have a domino affect on everything that came after. There's no telling what would and would not have happened. Amanda: That's a tough question because it could be radically different or it could be somewhat the same. Lisa: I agree with Stacy. It's one event that could have had a domino effect to so many other things in history. There's no telling how things would have been different. Elizabeth: This really gets into the whole Butterfly Effect/predestination debate about time travel, doesn't it? I guess one thing that I would expect could be different is just simply having a more populated Scotland. Having a couple thousand men survive, and extrapolate descendants for 200 years, and you've got a significant population increase. Does Frank believe Claire's story? Why or Why not? Stacy: I think he wants to believe. He might still be a little skeptical, even with the evidence of the clothes staring him in the face, but it's hard to blame him for not feeling 100% sure. Amanda: I think he's on the fence. I'm sure seeing how old the clothes she was wearing lead him to believe her, but he must have his doubts. Either way, he wants to believe her because he loves her and still wants to have a life with her. Lisa: I think he's so desperate to have his wife and old life back, that he's willing to take whatever leap is necessary to reach that end. Elizabeth: I got a pretty definitive believing vibe from Frank, but that could be because I'm juxtaposing how he dealt with her return here to the books. The clothes were just one aspect of making her story a little easier for him to swallow. I'm curious how his acceptance will impact how their marriage plays out down the line. What do you think about Frank's proposal to Claire to raise her child as his own? Stacy: His initial reaction to hearing she was pregnant and then realizing it couldn't be his was heartbreaking to watch. The fact that he's willing to raise the child shows how much he really loves Claire. It had me rooting for him even when he was showing flashes of his evil ancestor. Amanda: His initial reaction was understandable. Even though I love Jamie and Claire, it's hard not to root for Frank. His desire to raise Claire's baby as his own shows just how much Claire means to him. Lisa: When Frank told the story about him being sterile, you could see the look of anguish on his face. I think he would move mountains to be able to share the joy of raising a child with the woman he loves, even if it's not his own. Elizabeth: It is rather impressive, especially when you consider the social depressions of the era. At the same time, there are so many factors at play. If he wasn't sterile, would he have made the offer? If she wasn't pregnant, would he still be trying to stay with her? Remember, he was totally on the "Claire ran away" band wagon for a very long time. Back in France, Claire and Jamie have barely gotten started. How badly do you expect what happened with the ship's captain to affect their efforts? Stacy: Well, he's not happy about his ship and cargo needing to be burned to prevent the spread of smallpox, so he is going to make things very difficult for them going forward. Claire should probably watch her back. Amanda: It will definitely affect their efforts going forward. He did not seem like a someone who's very forgiving. Lisa: The captain didn't look too pleased with either Claire or Jaime. Smallpox or not, he didn't want to have to give up his ship. Like Stacy said, I think he's going to make things very difficult going forward. Elizabeth: This is when reading ahead is problematic. I know what's coming (generally). But I can't wait to see everyone else's reactions, so I'll keep mum on this one. *Bonus question: The show is filmed so beautifully. 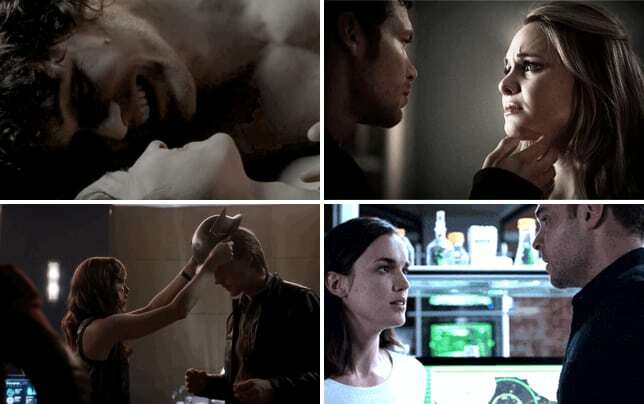 What was your favorite shot? Stacy: I really liked when Claire stepped off the plane, reaching for Frank's hand and then they cut to her stepping off the ship and taking Jamie's hand. Props to the editors. Amanda: It was so simple, but I loved the opening shot of Claire as she laid next to the stones. The angle hovering above her was perfect. Lisa: I really liked the scene with Clarie walking along the docks. The shot of the row houses was a like something off of a postcard. Elizabeth: I really liked the plane/boat transition scene as well, but I'm also going to give props to the set design team for the inn. It might not have been the dramatic sweeping landscapes or a beautiful establishing shot, but the little touches in their suite really highlighted the difference between 1740s Scotland and 1740s France. Quite the contrast to the inn where they spent their wedding night.